The outcomes of efforts now underway to prepare for and eventually implement REDD+ activities hinge on a number of important issues, and the resolution of the uncertainties surrounding these issues. These relate to: (1) the ecological impacts of climate change and their influence on REDD+ strategies; (2) policy approaches adopted towards REDD+; (2) forest governance, tenure rights, livelihoods and local communities; and (4) how REDD+ activities will integrate systems for measurement, reporting and verification (e.g., of carbon stock changes). These issues were the focus of the International Conference on Adopting REDD+ for Conservation, Sustainable Community Livelihood and Climate Change Mitigation held in Hong Kong on 13-15 December 2013. 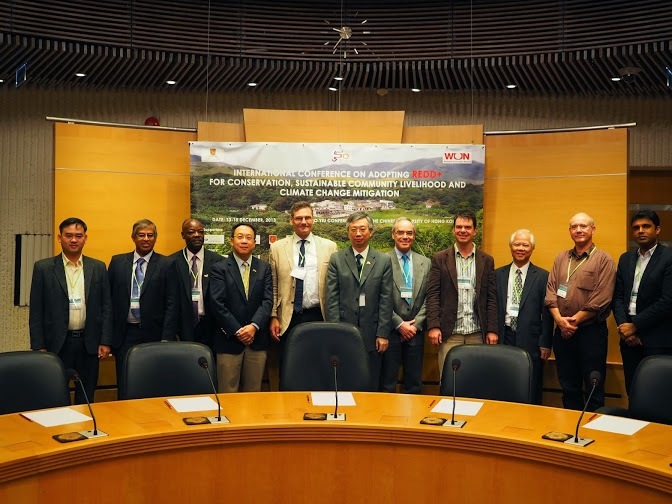 The meeting was organized by the Geography and Resource Department of the Chinese University of Hong Kong (CUHK), with support from the Worldwide Universities Network (WUN), IUFRO, the Institute of Environment, Energy and Sustainability (IIESS), Chung Chi College and United College in partnership with the University of Leeds, University of York, University of Bergen, University of Kwazulu-Natal, Utrecht University and Hue University of Agriculture and Forestry. Attendees included 80 local and international participants and presenters from 17 countries in Asia, Europe, Africa, North America, Latin America, and Australia. The conference included presentations from academics, policy makers and practitioners focusing on REDD+ and climate change issues from a variety of disciplinary angles, including ecology, forestry, geography, anthropology, economics, sociology and policy science. On the third day a fieldtrip highlighted examples of local forest management in Hong Kong, including sacred or feng shui forests, forest uses by local communities, and potential payment for environmental services (including carbon sequestration). Conference presentations and discussions highlighted a number of important conclusions similar to those of the recent (2012) IUFRO-led Global Forest Expert Panel assessment “Understanding Relationships between Biodiversity, Carbon, Forests and People: The Key to Achieving REDD+ Objectives”. These include, among others, the importance of understanding the effects of climate change itself as well as other factors driving forest and biodiversity loss and degradation, and how these changes are affecting the livelihoods and development prospenviects for forest-dependent communities. Local case studies emphasized the importance of forests for the multiple environmental services they provide, particularly those related to local livelihoods and food security, and that these “co-benefits” of REDD+ are likely to be far more important to communities than the monetary payments expected from implementation of REDD+ programs. Further, a number of presentations emphasized the need for REDD+ or other Payment for Environmental Services (PES) programs to integrate social (particularly poverty reduction) objectives within their planning and implementation frameworks and to work within existing governance arrangements and markets mechanisms (such as forest certification) to achieve lasting results, and the importance of secure tenure and property rights to achieve both carbon sequestration goals and other, more locally relevant and important, environmental and socioeconomic objectives, including equitable benefit-sharing.